Decorative Buddha images, Ayuthaya period. 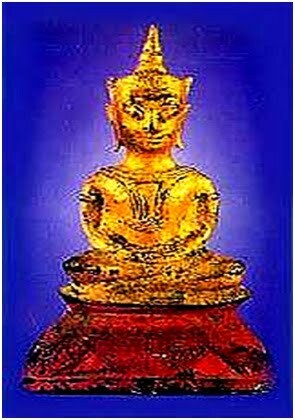 Once-called Phra Ngang but now called "Phra Chai" Buddha images.They are evolutional form of the decorative Buddha images, stressing on structure more than extravagant details. Phra Ngang is a vocab for calling a specific statuette of about 3-4 inches high. It refers to the Ayuthayan statuette that has no robe, sitting on a triangle base. Such the statuette was so called for many decades just because the former-generation people misunderstood that it's not represented Lord Buddha. So, they put Phra Ngang in the trouser's pocket. But it is now clear that they are misunderstood by the characteristics of the statuette. 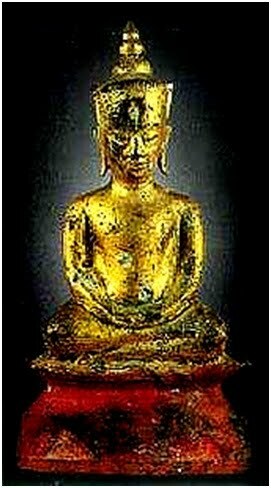 Present-day collectors now call the statuette "Phra Chai" which means Buddha image of Victory. Phra Ngang is the evolutional form of a decorative Buddha image which depicts the Lord subduing Phya Chompoo(Mara) who was arogant for his great wealth. Once Phya Chompoo met the Lord , he arrogantly paid no respect to him. He thought that no one could compare to him on the wealth. Lord Buddha, a former wealthy prince, used his miraculous power create a mountain of treasures much more than Phya Chompoo' s and transform his body to be the greatest emperor, fully decorated with precious jewels. Phya Chompoo was so frightend with the Lord's great power and yielded to him. The Lord taught him that being an emperor did not mean far more better than others because that one still face with sufferings and the death, and that a best human being is one who could destroy all evils in his mind and attain Nipphan(Niravan)-no rebirth again. By the Lord's teaching, Phya Chom poo enlightened the truth and requested for an ordination from the Lord, and the Lord gave him a benevolence. We have found many Ayuthaya period's decorative Buddha images. All of them were created based on the mentioned legend with two characteristics, sitting and standing. The specific name of this Buddha image is "Subduing-Phya-Chompoo Buddha Image". The sitting type has far more evolution. 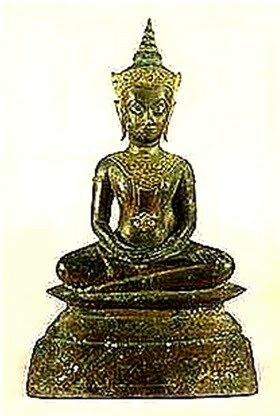 The decorative Buddha image has developed to a plain statuette stressing on its structure more than extravagant details. Even though, so many people still misunderstands about its characteristics and origin. 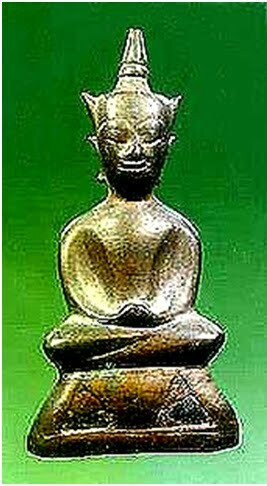 The naive monks and lay persons commercially produce weird statuettes with red eyes and curved top-stem. They are still called Phra Ngang. All these are imaginary items and not accepted by Thai veteran collectors. And a lot of them are exported!! Do you have one of those items ? ?